You most likely have been receiving grapes, apples, pears, plums and peaches from Chile. Much of the fruit is shipped immediately to distribution centers while some of the fruit is placed in cold storage. One defect you may see, especially from plums that may have been in cold storage is shriveling. The shriveling will most likely be caused by the fruit losing some its moisture, yet it will still be firm to the touch. When inspecting plums do not squeeze the fruit to make the skin shrivel; for the plum to be considered a defect by shriveling it must be noticeable upon careful examination. How much is allowed, on the plum, to be considered shriveled? Any amount. 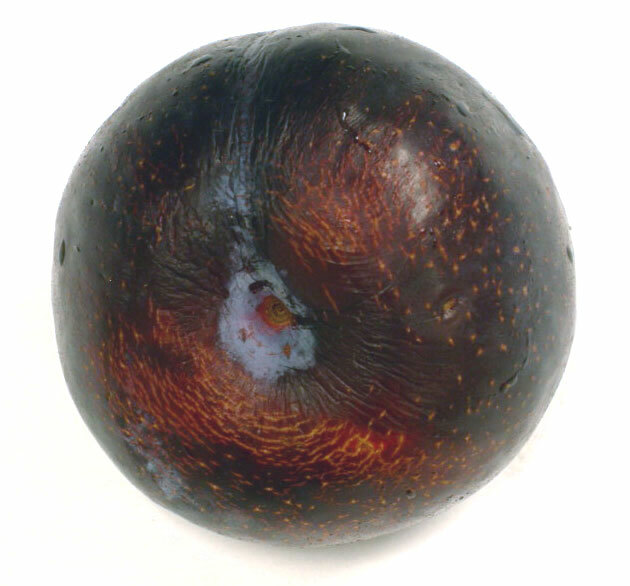 If you can see the shriveling, the plum is a defect. How many plums can have shriveling? Because shriveling is always considered a serious damage defect, only 6% of the plums in a lot are allowed to have shriveling. The shriveling is usually found around the stem area, but in extreme cases the shriveling may extend down the sides, especially along the suture. Of course nothing is ever simple. If you are inspecting President Plums, shriveling is much more common. For this reason the USDA allows an area of up to a 1/2 inch of shriveling extending from the stem scar. In other words, if the shriveling on President Plums extends greater than 1/2 inch from the stem scar it is a defect, considered as serious damage.